HUGE PRICE REDUCTION! CLICK VIRTUAL TOUR LINK TO SEE THIS PROPERTY IN ACTION! 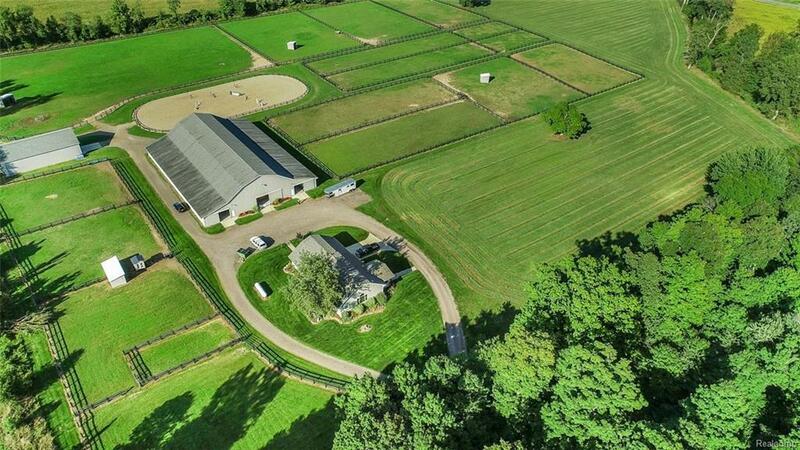 Meticulously maintained, turnkey equestrian facility situated on 27 acres. The main barn is 110âx160â which boasts a 60âx150â indoor arena, 19 matted stalls, 2 heated tack rooms with 19 lockers, heated observation room with bathroom, wash rack, multiple grooming areas and more. The 1,734 sq ft home had a addition built in 2015 along with a complete renovation of interior and exterior. The home features custom distressed hickory hardwood floors, slate tile flooring, chiseled edge granite countertops, vaulted and cathedral ceilings and knotty pine walls and ceilings. The gorgeous landscaped exterior includes James Hardie siding, a custom stone work front entry and covered porch, a trex deck and sprinkler system. Equestrian amenities also include a 110âx210â engineered outdoor arena with sprinklers, 16 pastures, 1 rehab paddock and 5 run-ins. An additional 40'X64â building provides equipment and hay storage.